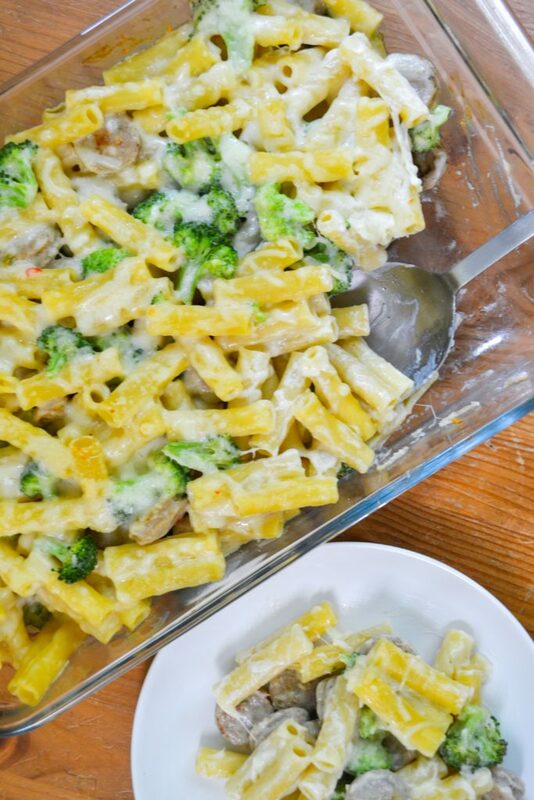 This Quick and Easy Chicken Penne Pasta Recipe is going to be your easy weeknight dinner go to. A kid friendly dinner that will take 30 minutes or less form start to finish, you’ll be able to whip up this school night meal in between pickup and soccer practice. No more drive through meals – this 30 minute meal is a live saver! 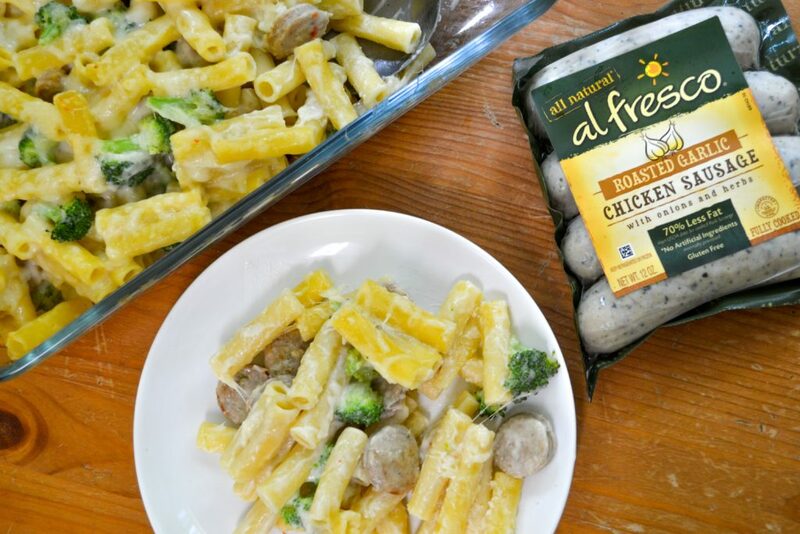 The easy chicken alfredo bake uses chicken sausage instead of chicken breast to cut down on time and dishes, and is sure to be loved by the whole family. This is a sponsored post I wrote in collaboration with al fresco chicken sausage. All thoughts and content are my own. Thank you for supporting Morgan Manages Mommyhood! As we start to dig into fall and the back to school season, I’m sure most of us are beginning to question our sanity and wonder where on earth the entire day goes. While I believe I’m incredibly lucky to be able to work from home, send my boys to prek a few days a week, and have incredibly gracious and generous family that helps share the workload of kiddos, I still panic a little each week when I think of all I have to do. Take Monday, for example – wake up, get the kids and Alex food, attempt to clean up the house, get the boys ready, get them to school, do a MUCH NEEDED grocery store trip, groceries away, work, eat, work, start dinner, pick up boys, eat dinner, clean up dinner, try to fit in a run, then bedtime routine. You guys, it’s exhausting. Being a parent is exhausting and just reading that list makes it so clear why so many Americans choose to just grab convenience food instead of taking the (precious, lacking!) time to make dinner each night. When I was a kid I never got the concept of 30 minute meals. Because really, how long could making a dinner take, right? DAYS. It feels like days, sometimes. Especially if there are multiple aspects (hello, homemade burrito bowls) or lots of chopping. And while I love being in the kitchen and making homemade meals, the only thing worse than sacrificing time to make a full meal is when your kids give you a big ol’ nope and refuse. Lord help me, am I right? Which is why I love super simple meals like this Quick and Easy Chicken Penne Pasta recipe. 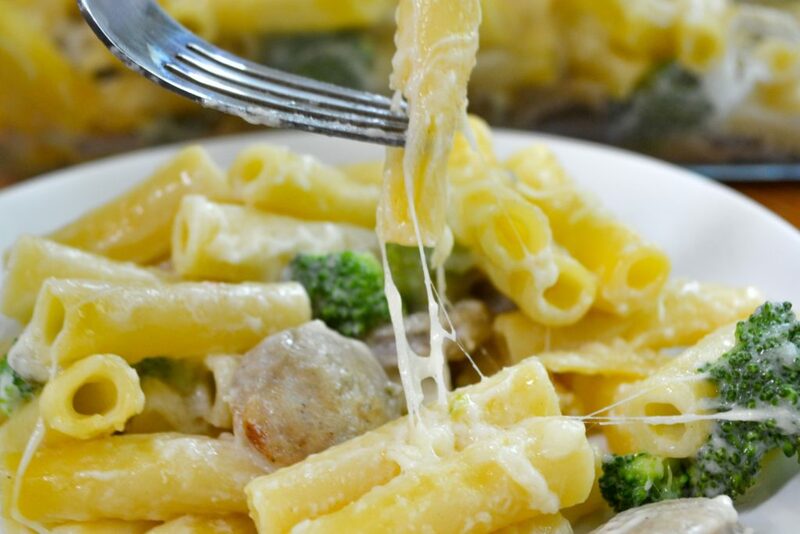 Packed with kid friendly favorites – pasta! Cheese! – and approachable veggies, your whole family is going to love it – and you’re going to love how quick and simple it is. Boil pasta ahead of time – if you can, boil the pasta and broccoli to a little less than al dente the night before or the morning of, shock it in cool water to stop cooking, toss with a little olive oil and put into a zip top bag. Same with the sauce – make the sauce ahead of time then you just need to stir everything together, cut the sausage, and toss in the oven. Even better – make the whole thing ahead of time. Make the meal right up until you bake it, cover in aluminum foil, and toss in the fridge until you’re ready to bake. You might need another 10-15 minutes for account for the cool dish, but you can use that time to clean up, relax, help with home work, or hell, just pour yourself a glass of wine. Use fully cooked sausage – we love al fresco fully cooked chicken sausages! Not only do they taste amazing, but they cut down on the time – no cleaning a million utensils to avoid cross contamination, no browning or pre cooking – just slice ’em up, toss into your dish, and move on! Use this hidden veggie Alfredo sauce to add some extra nutrition to this meal! 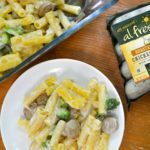 The real key to making this super quick chicken penne pasta recipe is to use the al fresco fully cooked chicken sausages – I’ve made this twice since first experimenting and once I used the roasted garlic and once I used the Sweet Italian Sausage and both were perfect. al fresco fully cooked chicken sausage is just that – super flavorful sausages that are fully cooked to help cut down on time. No pre cooking meat, no worrying if something is cooked through, no dirtying a million dishes! Quick and Easy Chicken Penne Pasta Recipe is an easy weeknight dinner go to. A kid friendly dinner that will take 30 minutes or less form start to finish. Preheat the oven to 425. Boil water for pasta and cook pasta per directions on box to al dente. In the final minute of cooking the pasta, add the broccoli florets to blanch. Rinse drained pasta and broccoli in cold water to stop the cooking process and shake to dry well. While pasta is cooking, slice chicken sausage and start the sauce. Once pasta is cooked and sauce is finished, combine the two with the sliced al fresco chicken sausage. Add pasta mixture to a large baking pan, sprinkle with cheese, and bake 15-20 minutes until cheese begins to brown and gets bubbly. Melt butter in a pot on medium before whisking in flour. Whisk and cook for about 2 minutes, or until a roux has formed and the mixture is light brown. Slowly, add milk while whisking. Stir regularly and cook on medium low until the sauce thickens. When desired consistency, remove from heat and add cheese. You can skip baking the pasta is you're in a pinch, but I would brown the sausage and cook the pasta fully. al fresco sausage is precooked, but tastes a million times better when heated up before serving. Okay so tell me – what are your tips for easy week nights? Have you ever tried the al fresco chicken sausage? let me know in the comments! Other quick dinners you might enjoy..
Pizza Chicken – a 4 ingredient, 15 minute dinner! My kids eat their veggies every day without complaining. Want my secret? Grab the Outsmart your Picky Eater cheat sheets to get the inside scoop on how to add veggies to food your kids already love. My grandkids would so eat those up! I love trying different flavors of sausage! Pinning this for later! Thanks Cathy!! It’s so tasty!